An undignified end for unidentified migrants in Texas. 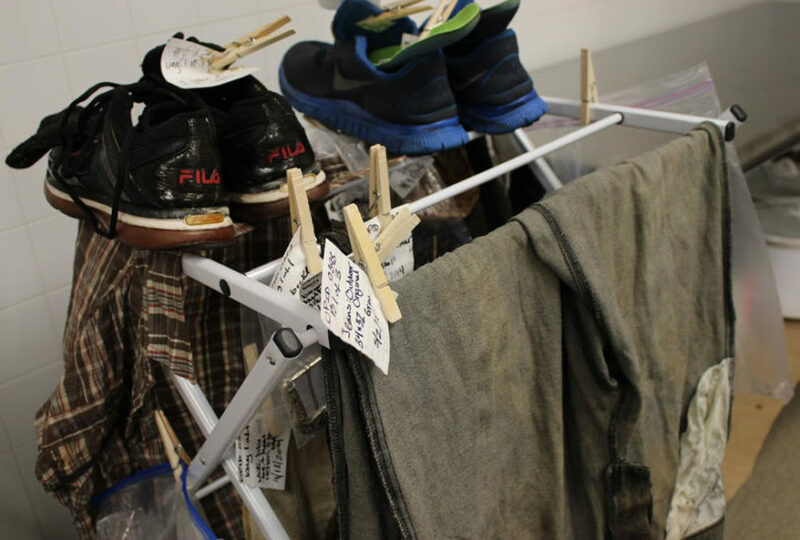 Clothing found on the bodies of unidentified migrants in Brooks County, Texas. As uncovered in our Left for Dead series, there are more than 10,000 known Jane and John Does in the U.S. – unidentified and unclaimed bodies languishing in limbo for years, sometimes for decades. In this episode of Reveal, we crisscross the nation tracing these cold cases, showing why so many bodies remain unidentified despite new and powerful forensic tools. In some cases, amateur Web sleuths end up cracking cases that stymied law enforcement. In 1969, a young woman was found stabbed to death in Harlan, Kentucky, and buried without a name. To many locals, she’s known as “Mountain Jane Doe.” To Darla Jackson and Todd Matthews, her case deserved a little extra digging. We follow Darla and Todd into the wooded hills of Harlan to exhume the body of Mountain Jane Doe. What they end up finding is … unexpected. 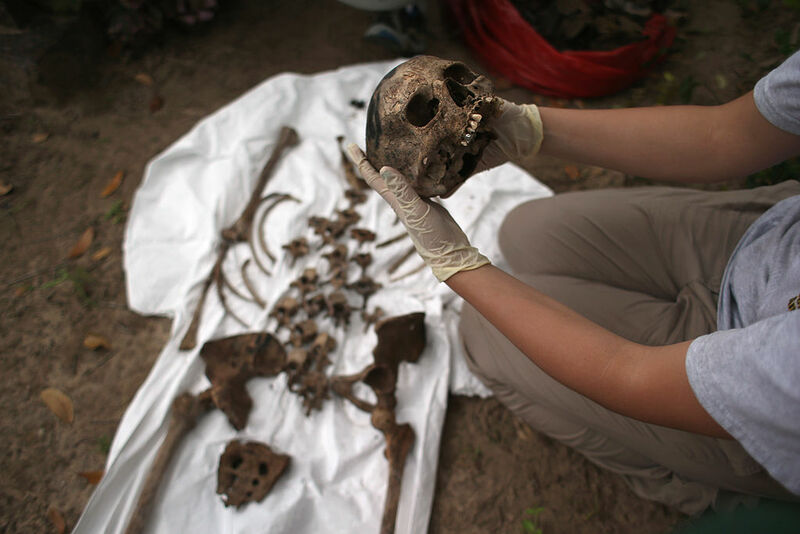 In 2014, a team of forensic anthropologists unearthed mass graves containing the remains of more than 300 migrants. Rampant violations included an illegal failure to collect DNA samples and to properly label remains. Out of the thousands of unidentified bodies scattered across the country, many are found in South Texas, where migrants are crossing into the US from Mexico. Crossing the border is treacherous — it's hot and there's a lot of ground to cover. Dehydration and heatstroke claim many who try to make the trek. And dying in Brooks County means that sometimes, their bodies aren't found, let alone identified. So what happens to these remains? Host Al Letson and producer Delaney Hall travel to the border to find out, and they interview The Investigative Fund's John Carlos Frey about what he learned while reporting. The funeral home connected with the botched burials was part of a chain. Its CEO was one of Rick Perry's top donors. Read more from our award-winning series “The Deadly Checkpoint,” which captured the intense desperation experienced by dying migrants and produced a life-saving influx of search-and-rescue agents to the region. This segment was produced in partnership with The Investigative Fund at The Nation Institute, now known as Type Investigations. In 1980, 18-year-old Michelle Busha left home and never returned. It’s every family’s worst nightmare and it’s a circumstance so tragic that it touched a complete stranger thousands of miles away. Reporter Michael Montgomery meets two women who didn’t know each other, but each had a deep connection to the young woman who disappeared 35 years ago. Solving the case was bittersweet. Both women found the answers they were seeking, but one had to face the reality of her sister’s chilling death. This story is featured on the September episode of “Reveal,” a new investigative public radio program and podcast produced by The Center for Investigative Reporting, a nonprofit newsroom based in California, and PRX. Subscribe to the podcast and learn more at www.revealnews.org. Segment #2 of this episode was produced in partnership with The Investigative Fund at The Nation Institute, now known as Type Investigations. 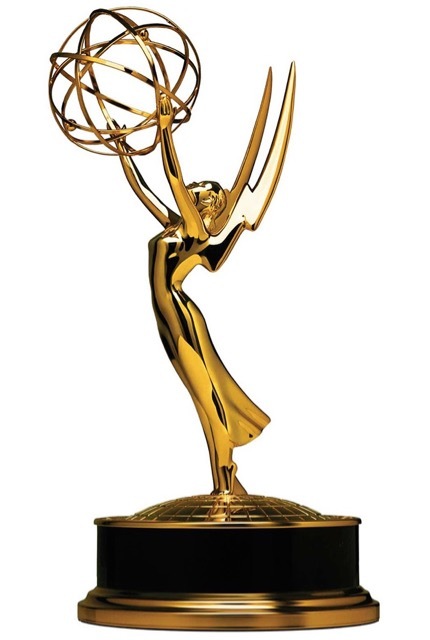 John Carlos Frey is an investigative reporter and documentary filmmaker based in Los Angeles. Al Letson is the host of Reveal's Peabody Award-winning public radio program and podcast showcasing investigative stories.